Available to consult with referring physicians, both before and after exams, to discuss exam choices, protocols, findings and treatment options. Onsite to monitor each exam as it is performed, eliminating unnecessary radiation and contrast. Onsite to provide patients with the preliminary results of their imaging exams (OnSite Results) and are available to discuss these results. Versed on technical issues and safety concerns, and follow HIPAA privacy and security rules, safeguarding patient confidentiality. Published in peer-reviewed literature and have lectured at local and international meetings. Dr. Hammerman obtained his undergraduate and medical degrees at Washington University in St. Louis. He completed his radiology training at the Jewish Hospital of St. Louis and Washington University’s Mallinckrodt Institute of Radiology. He is board certified by the American Board of Radiology. He received specialty training in diagnostic radiology, magnetic resonance imaging, computed tomography, ultrasonography, mammography and interventional procedures. Dr. Hammerman developed Metro Imaging’s OnSite Results program, which has received national recognition. He has written and lectured on the program, and is widely quoted. Dr. Trotta obtained his undergraduate degree at Case Western Reserve. He obtained his medical degree and completed his radiology training at St. Louis University, where he served as an instructor. He was chief of radiology at Naval Regional Medical Center in Newport, Rhode Island. He is board certified by the American Board of Radiology. He received specialty training in diagnostic radiology, magnetic resonance imaging, computed tomography, ultrasonography, mammography and interventional procedures. Dr. Trotta is recognized throughout the St. Louis metropolitan area for his expertise in temporomandibular (TMJ) magnetic resonance imaging. Dr. Tchatalbachev obtained his undergraduate and medical degrees at the University of Missouri in Kansas City. He completed his internship, diagnostic radiology residency, and musculoskeletal fellowship at the University of Missouri in Columbia. In addition to his fellowship training, Dr. Tchatalbachev has had specialty training in diagnostic radiology, magnetic resonance imaging, computed tomography, ultrasonography, mammography and interventional procedures. Dr. Tchatalbachev was born in Bulgaria and moved to St. Louis at the age on ten. Dr. Jasti did her premedical studies at Harvard University. She obtained her medical degree at the Stony Brook School of Medicine. She completed her radiology residency and a musculoskeletal/neuroradiology/body MRI fellowship at the University of Rochester Medical Center. In addition to her fellowship training, Dr. Jasti has had specialty training in diagnostic radiology, magnetic resonance imaging, computed tomography, ultrasonography, mammography and interventional procedures. She has presented numerous papers related to her fellowship training. Dr. Hammerman obtained his undergraduate and medical degrees at Washington University in St. Louis. He completed his radiology training at the Jewish Hospital of St. Louis and Washington University’s Mallinckrodt Institute of Radiology, where he coauthored numerous publications. He is board certified by the American Board of Radiology. He received specialty training in diagnostic radiology, magnetic resonance imaging, computed tomography, ultrasonography, mammography and interventional procedures. Dr. Hammerman is on the faculty of Washington University, where he teaches imaging anatomy. Dr. Foust obtained her medical degree at the University of Louisville School of Medicine. She completed an Orthopedic Surgery Residency at the University of Maryland, a Diagnostic Radiology Residency at St. Louis University and a Musculoskeletal Fellowship at the Mallinckrodt Institute of Radiology. 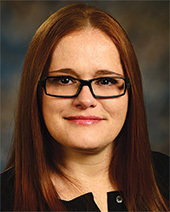 In addition to her fellowship training, Dr. Foust has had specialty training in diagnostic radiology, magnetic resonance imaging, computed tomography, ultrasonography, mammography and interventional procedures. Dr. Hoffman obtained his undergraduate degree at Washington University in St. Louis and his medical degree at St. Louis University. He completed his radiology training at the Jewish Hospital of St. Louis and Washington University’s Mallinckrodt Institute of Radiology. Dr. Hoffman is board certified by the American Board of Radiology. He received specialty training in diagnostic radiology, magnetic resonance imaging, computed tomography, ultrasonography, mammography and interventional procedures.